Depend Anatomic pads are designed to be worn with Depend stretch pants and provides comfortable & easy to apply protection. The one size fits all and are a great solution for caregivers and wearers and provides extra control odour for greater confidence and keeps wearer dry with the Absorb Loc core. The breathable design helps maintains skin health. 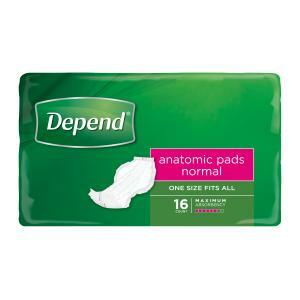 Depend Anatomic Pads Extra have a cloth-like breathable cover, soft leakage guards and a full length wetness indicator.